If you live in Scotland or the North of England why not make a date to come along to the Scottish Caravan and Outdoor Leisure Show, Scotland's only dedicated event for caravanners and those who love the outdoor life. 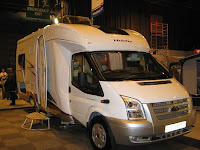 The show will take place at the SECC, Glasgow from 2-5 February 2012. We have two tickets to give away so either add a comment to this email with your email address or find us on Facebook or Twitter (@frenchcampsites) and enter the competition there. This fantastic show will once again occupy all 5 halls within the SECC, providing the perfect place to see the latest Caravans, Motorhomes, Holiday Homes, Accessories, Marine Products and Camping Products etc. 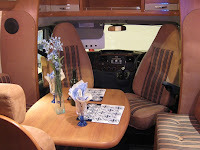 If you are thinking of buying a motorhome or caravan this is an ideal place to come along and actually sit in them and see what you think. Ideally come on one of the weekdays rather than the weekend. If you are coming from the rest of Scotland or the North of England, you will find that the SECC is very easy to get to, being just off the M8 and the Kingston Bridge in the Centre of Glasgow. There are lots of accommodation choices in the area, either in Central Glasgow or why not take a break out in the suburbs such as one of the Travel Inns in Bearsden/Milngavie, where you can spend a pleasant evening and eat in one of the local restaurants. I can recommend the West Highland Gate Beefeater, Las Ramblas Tapas Restaurant in Bearsden or Massimo's in Bearsden or one of numerous country pubs such as the Old Mill in Killearn or the Beech Trees at Strathblane. So why not make a holiday of your trip to one of the first Caravan shows of the season ! The French Film, The Artist, has deservedly won a Golden Globe award ! The male lead, Jean Dujardin won the Best Actor Award at the 2011 Cannes Film Festival, where the film premiered. The film was nominated for six Golden Globes, the most of any film from 2011, and won three, including Best Motion Picture - Musical or Comedy. One of a few great French films from 2011, (others include Intouchables (The Untouchables) and The Well Digger's Daughter), The Artist is set in Hollywood between 1927 and 1932, just as the era of silent movies is ending. The film is filmed entirely in black and white and largely without speech, this modern film made in the style of a silent movie with all the plot conveyed purely in facial expression and body language ! The two lead actors were unknown to me but they manage this wonderfully. The plot revolves around the male lead, a silent movie icon (played by Jean Dujardin) whose career is dwindling with the advent of the new talking films and the female lead (Bérénice Bejo) who is an up and coming talking movie star. The film is romantic and a delight and I think it is one of 2011's "must see" films ! The film is directed by Michel Hazanavicius and was released in UK cinemas with a PG rating on 20 November 2011 and the DVD has still to be released. Have you seen it - did you enjoy it ? 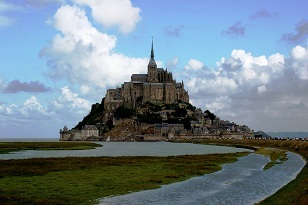 Mont Saint-Michel again reported the greatest number of visitors with about 3,000,000 visiting the fabulous site in the famous Bay of Mont Saint-Michel. However a competitor site which hopes to catch up by 2019 is the famous château de Chambord in the Loire, which had an increase of 50,000 visitors for 2011 year to hit a record of 780,000. The Ministry of Culture also announced good results regarding attendance of museums, which grew 5% in 2011 with a total of 27 million ! the Museum of the Louvre, had 8.8 million, an increase for the fourth consecutive year. It is ahead of the Palace of Versailles (more than 6 million), the Pompidou Centre (3.6 million, an increase of 15%!) and the musée d'Orsay (3.1 million). Where did you visit this year ? And can you recommend anywhere either on this list or some hidden gems that are not usually mentioned ? We certainly love the theme park Puy du Fou which is listed as having over a million visitors a year. The most popular theme park is still the two Disneyland, Paris parcs which receive 14.5 million visitors a year and the Parc based around the French character Astérix, Parc Astérix near Paris which has 1.6 million visitors a year ! The Futuroscope theme park at Poitiers has 1.6 million visitors a year. And of course we cant forget The Eiffel Tower in Paris which has 6.8 million paying visitors a year although I am sure a lot more who just go along to take a photograph ! Another popular sites to give a try is the La Villette science museum in Paris which has around 3 million visitors.